Available in multiple sizes to fit all 5th wheel RVs. All-season protection against snow, rain, sleet and hail. 600 denier polyester material for advanced durability. Double-stitched seams to prevent tearing. Breathable material with top curtain air-vents to prevent moisture buildup and mildew. Easy access zippered door flap. Adjustable quick release buckles to hold the cover in place. Lock grommets available around the bottom skirt of the cover. 3 year Coverking Factory warranty. Available in multiple sizes to fit any Class A RV. Available in multiple sizes to fit any Class C RV. Available in multiple sizes to fit all Travel Trailer RVs. 3 year Coverking Factory warranty . 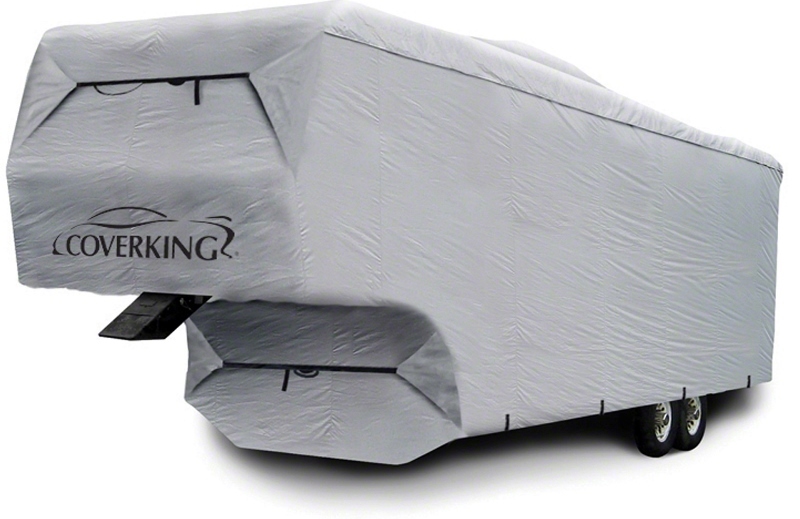 Coverking's RV covers are an outstanding value and provide amazing protection for your RV. 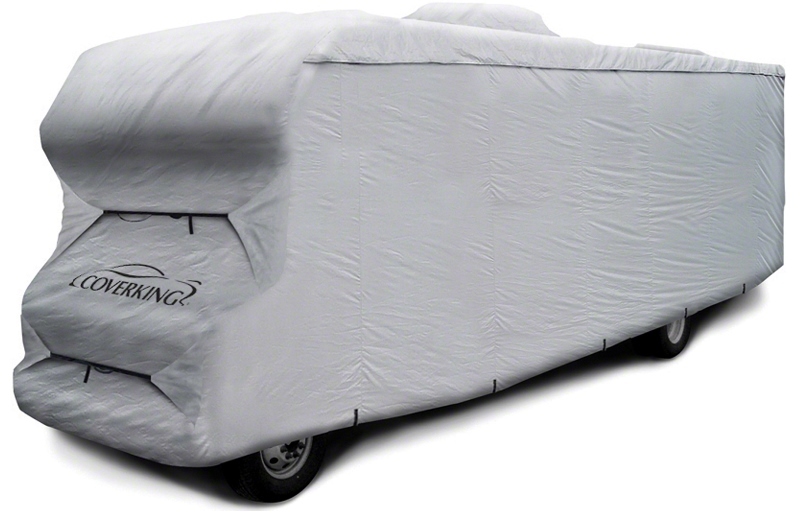 Made from 600 denier polyester, this RV cover is tougher and thicker than the average universal RV cover. The 600 number refers to a type of polyester thread count in one-inch intervals (the higher the thread count, the tougher it is). All seams use an advanced double-stitched method so covers remain water-resistant even at the closure. 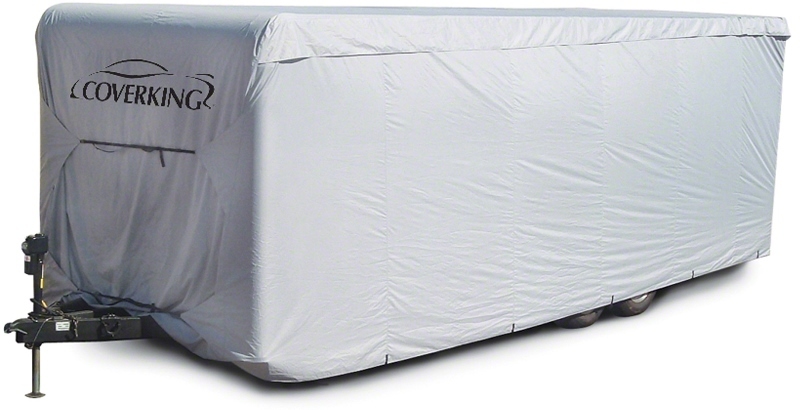 The RV cover is also breathable to ensure moisture is not trapped within. Ventilated air-vents are aligned around the top edge to reduce wind friction and to prevent moisture buildup. 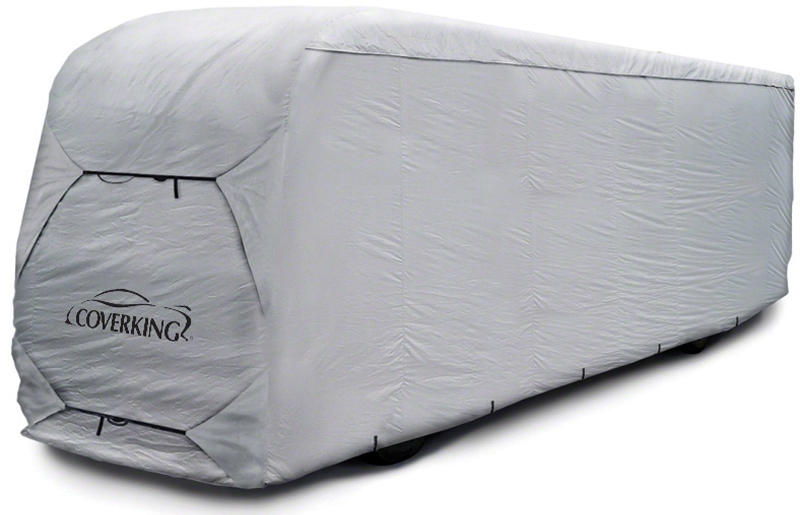 Coverking RV covers come with a built-in zippered-door-flap for easy in and out access. To keep the RV cover in place, adjustable buckles are integrated on opposite ends. Presidium 600-denier polyester material perfect for all weather conditions. Soft to the touch and won't scratch surfaces.